The Evening Standard came to Battersea Park to interview local parents and take photographs of their children for a news report on May 12 with the headline: You want to go into the playground? That will be £2.50 please. 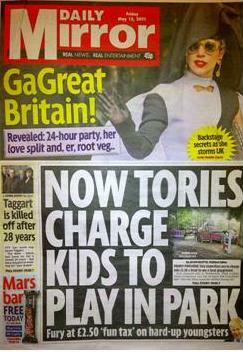 The Daily Mirror features the campaign on its front page on May 13 Tories blasted for charging kids to use public playground and ran an opinion piece titled “Playground tax is not fair play“. The plan to charge for access to the playground is a topic of discussion on Mumsnet, Nappy Valley, Streetlife, Facebook, Twitter, CBBC Newsround and has also been featured by regional news outlets such as the Belfast Telegraph.